Think there’s nothing hunting-related to do during late winter? Try shed antler hunting! In the Inland Northwest late winter and early spring can prove the season of schizophrenic weather. A few days of sunshine and gorgeous weather easily tricks you into believing spring is in the air, only to find yourself driving white knuckled atop snow and ice a few days later. Blood sport hunting is definitely finished, but dedicated hunters enjoy outdoor adventure by hunting antlers cast off by deer, elk and moose before they prepare to grow next year’s rack. This is a natural phenomenon occurring late each winter into early spring. Increasing photo period triggers something deep inside the deer tribe’s cerebral cortex, released hormones miraculously breaking the bond between skull-pedestal bone and antler base, until a slight jar (more in a moment) sends the antler(s) tumbling. Whitetails normally begin this process in late January, moose through February, elk typically dropping late February through April. A new set of antlers begins to develop almost immediately, staring the process anew. 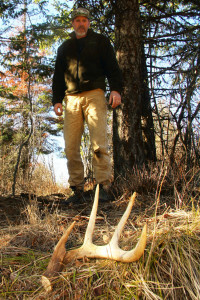 Shed hunting offers several exciting attractions: learning more about your hunting area’s trophy potential, the thrill of finding a little piece of nature to display or make something useful with (knife handles, maybe candle holders), or an opportunity to earn pocket money while enjoying the great outdoors. For me finding antlers is portion to my trophy-hunting bent (though I’m also very much a meat hunter!). Knowing a monster buck is around via shed-antler evidence allows me to slap the alarm clock with vigor following season opener, and makes it easier to pass smaller bucks while dreaming of bigger things. It is also nice to simply have antlers lying around. They are trophies in every sense of the word that my European mounts and taxidermy are and for the same reasons. They allow me to vividly recall a grand day afield and all the sights, sounds and smells experienced. For others shed hunting is a money-making proposition. A quick check of any local fur/antler buyer’s web site will reveal premium antlers are currently fetching around $11 per pound. 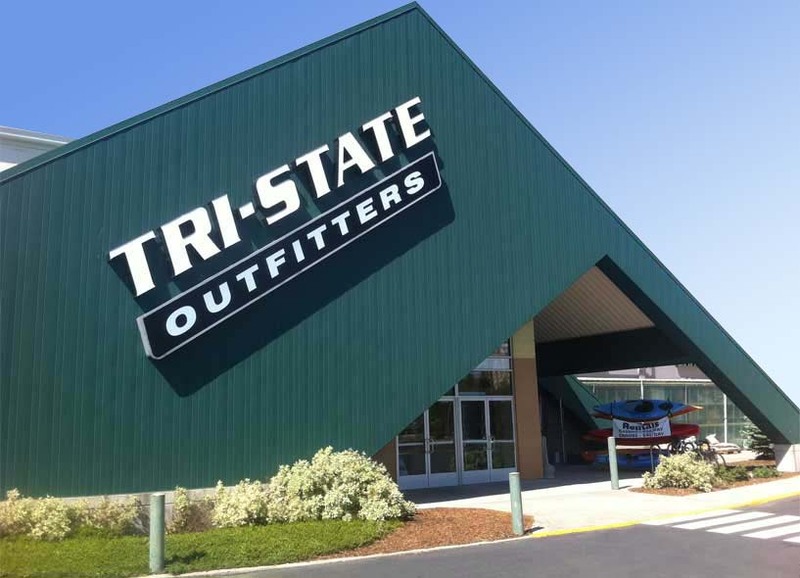 Premium prices come from the freshest (no UV damage), intact (no broken tines or rodent gnawing) and biggest (trophy sized) specimens, lesser prices garnered by antlers that are sun bleached, rodent chewed or broken to love’s labors lost. These are used by craftsmen building rustic furniture, chandeliers and such. The ultimate jackpot is discovering matching sets of record-book-sized antlers. I have heard of collectors paying up to $2,500 for a single set of matching trophy antlers from a record-book elk or Boone & Crockett-class whitetail. The most productive antler-hunting spots are generally south-facing slopes, benches and ridge tops where animals camp out to soak up sun during cold mornings, large meadows where the first green of spring appears, farm-field edges and fence-lines. 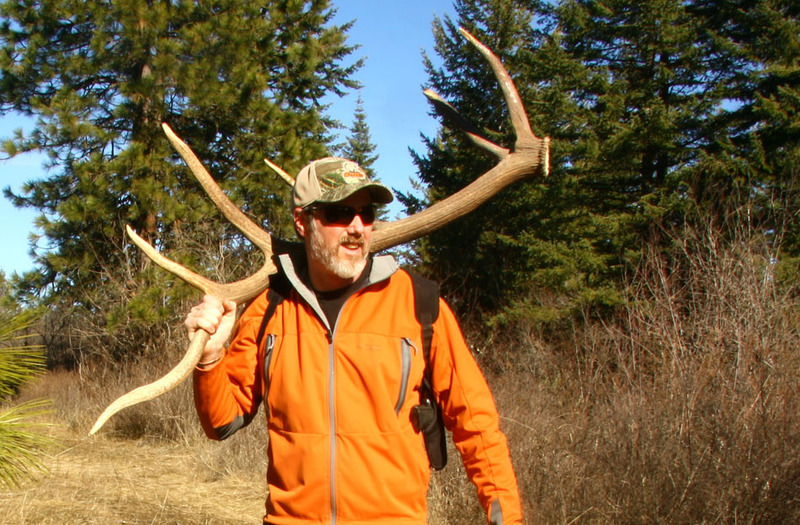 Too, anywhere you see large concentrations of animals in the next couple weeks—usually at lower altitudes adjacent higher country—are good bets for locating the year’s first shed antlers, as well as worth coming back to later. 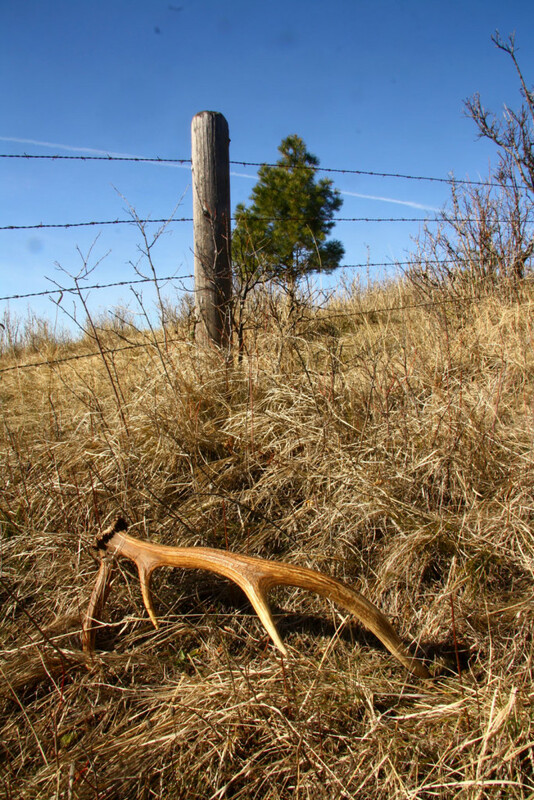 Fence-lines strung through prime game habitat are also productive because animals jump these obstacles, creating that sudden jar discussed earlier, depositing antlers for the taking. I normally hike up or down one side of a fence while walking away from the truck or ATV, jumping across the fence and returning on the opposite side. Remember, antlers don’t always drop right along the fence, often found a few jumps away where a running animal lost them. Too, when I find one good antler, I’ll canvas the area by describing widening corkscrew circles around the original find. Losing a big antler, especially larger elk or moose, causes a real imbalance and animals will often actively work to dislodge the opposite side to restore balance. This means the match is often found not far away from the first. There’s also the fact most late-winter and early-spring bucks and bulls travel in bachelor groups, meaning antlers from several animals are likely to be deposited in the same general vicinity if those animals have spent a good deal of time there. On open slopes, climbing to an opposing vantage and glassing carefully with something like a 10x42mm or 12x50mm binocular can sometimes reveal trophy antlers. This also allows you to cover more ground with much less shank’s mare. 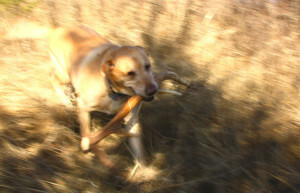 Others introduce dogs to the mix, teaching Fido to pick up sheds by playing fun fetch games with fresh antlers while they’re young and impressionable. This is actually fairly easy with younger dogs, spending 15 to 20 minutes a day playing fetch with a fresh shed, giving them a specific command such as, “Hunt Shed!” and rewarding them with a treat after successful retrieves. After a couple weeks you might hide shed antlers in grass or wooded areas and walk your dog through, repeating your specific command, and offering treats when Spot discovers and delivers a shed. It doesn’t take long before your dog begins to associate shed antlers with treats and subconsciously keeps their nose tuned for sheds, no matter what you are up to. Whether you decide to take shed hunting seriously, wearing out boots covering substantial miles, or use it as a simple excuse to get outside on a fair day, antler hunting is the sport de jour for the transition between suborn winter and reluctant spring. Patrick Meitin has guided hunters into New Mexico's Gila Wilderness, and made personal trips into the wilderness of Alaska, Canada, Mexico, France, the Russian Far East and Africa.